600 buses in the Hillsbus fleet covering Castle Hill, Rouse Hill, Pennant Hills, Parramatta, Blacktown, and express services along the M2 Hills Motorway to the City will become Opal enabled starting from Monday 30 June. There are now more than 340,000 Opal cards issued, with the bus rollout expected to finish by the end of 2014. Plans for a tunnel connecting Parramatta Road to the M4 East portion of WestConnex that would have impacted on Ashfield Park have been abandoned as part of a deal between the NSW Government and the Shooters and Fishers Party. The tunnel will now emerge at another location, as yet undecided, which will leave the park untouched. In exchange, the Shooters and Fishers have agreed to not back a proposed Parliamentary inquiry into WestConnex. 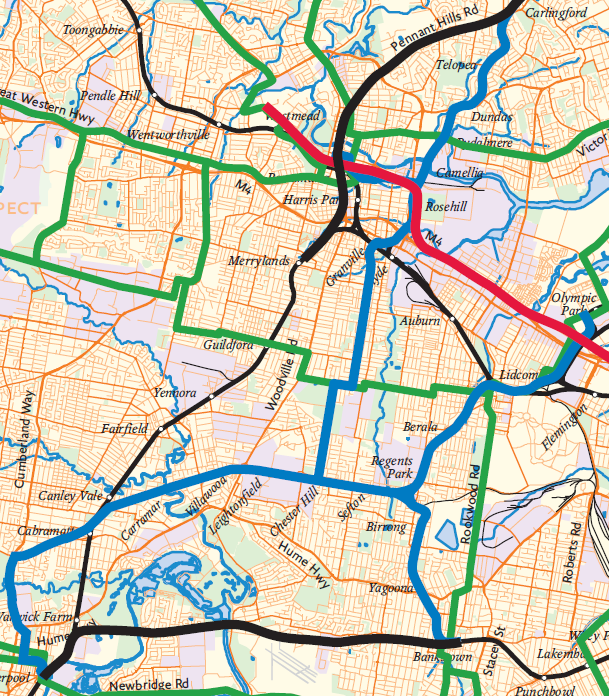 Previously planned links between the M4 and local roads around Parramatta have been abandoned as not “cost effective”. A number of the M4’s on and off ramps around Parramatta only provide access in one direction or only from certain roads. The planned widening of the M4 between Parramatta and Strathfield will still go ahead as planned. The NSW Budget included funding for $60bn of planned infrastructure spending over the next 4 years. 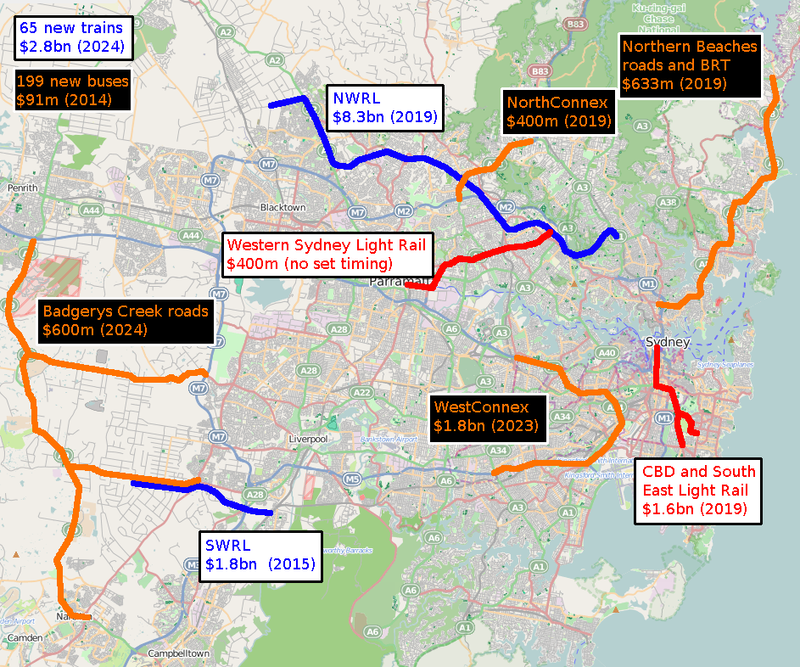 The spending includes new heavy rail lines (North West Rail Link, South West Rail Link), light rail lines (CBD and South East Light Rail, a yet undetermined light rail line from Parramatta), roads (WestConnex, NorthConnex, roads around Badgerys Creek in Western Sydney, Northern Beaches roads and Bus Rapid Transit), and new public transport vehicles (trains and buses). Construction has begun on the 4km Skytrain viaduct for the North West Rail Link (NWRL). Two stations, Kellyville and Rouse Hill, will be on this portion of the NWRL, elevated above the ground. It will also include a rail bridge crossing Windsor Road. $11.4m will be spent this year to create a new Rail Operations Centre, which will consolidate the operations and communications functions that are currently geographically dispersed across Sydney. The concentration of these operations will allow for improved communications in responding to incidents on the network. However, concentration of operations has been criticised in the past. Last year a fire at one of Sydney’s signal boxes (there are 19 in total, with most equipment concentrated in 2 depots) caused a virtual shut down of all trains for 30 minutes on the Sydney Trains network (other than the T4 line). The lack of contingency was blamed for the shut down, with no back up plan available to take over once the signal box was evacuated. The Public Transport Command (PTC), police responsible for safety on public transport, was established in May 2012 and since then have issued 92,000 infringements, laid 9,000 charges, and made 5,000 arrests. Along with Transport Officers (responsible for checking that tickets are valid) the PTC replaced the old transit officers. Police and Transport Officers now patrol all forms of public transport (Transit Officers were only found aboard trains) but have been criticised for being fewer in number than the old Transit Officers. The 2014-15 NSW Budget contains $60bn of spending on infrastructure over the next 4 years. Major projects being funded are shown below. $8.3bn on the North West Rail Link, to be completed in 2019. $2.8bn on 65 new trains, to be completed in 2024. $1.8bn on the South West Rail Link, to be completed in 2015. $1.8bn on the WestConnex freeway: M4 East/M4 South/M5 East (topping up $1.5bn in Federal Government funding), to be completed in 2023. $1.6bn on the CBD and South East Light Rail, to be completed in 2019. $633m for roads improvements to the Northern Beaches, including kerbside Bus Rapid Transit, to be completed in 2019. $600m for roads around Badgerys Creek Airport (topping up $2.9bn in Federal Government funding), to be completed in 2024. $400m for light rail from Parramatta once a priority route has been identified (Parramatta to Macquarie Park shown in the map as a potential option) with no set timetable for completion. $400m on the NorthConnex freeway: M1 to M2 (topping up $400m in Federal Government funding), to be completed in 2019. $91m on 199 new buses to replace ageing buses and expand the fleet, announced in 2014. Infrastructure contingent on the sale of the electricity distribution network: an under the Harbour Rail Crossing (previously cited at around $10bn) and Northern/Southern extensions to WestConnex ($1.5bn) have been omitted from this list, as has the Opal rollout ($1.5bn) and an M9 Outer Orbital freeway (uncosted). Commentary: Is this worth it? This budget appears to be seen as quite popular. So much so that the Sydney Morning Herald began the losers portion of its “Winners and Losers section with “There are few obvious losers in this year’s pre-election budget”. Ultimately this budget provides a way of achieving the infrastructure that Sydney desperately needs in order to sustain the additional housing construction that is required to accommodate the millions of new residents it will have by the middle of the century. Asset recycling, the sale of 49% of the electricity distribution network seems to be the only way to achieve this. However, as the Daily Telegraph’s Andrew Clennell quoted a “senior Labor MP [who said]: The poles and wires gives you 10 years, then what do you do? The sale of Sydney Water? Then what?”. That question of how to fund infrastructure long term on an ongoing basis does not appear to have been answered yet. If it does get answered, the most likely response is higher taxes. So it that worth it? Quite possibly, though privatisation does give the state a decade or two before it needs to be answered. Around 100 buses operated by Forest Coach Lines in Northern Sydney have been Opal enabled. Opal is now available on 47 bus routes around Sydney, with 300,000 Opal cards currently in circulation. 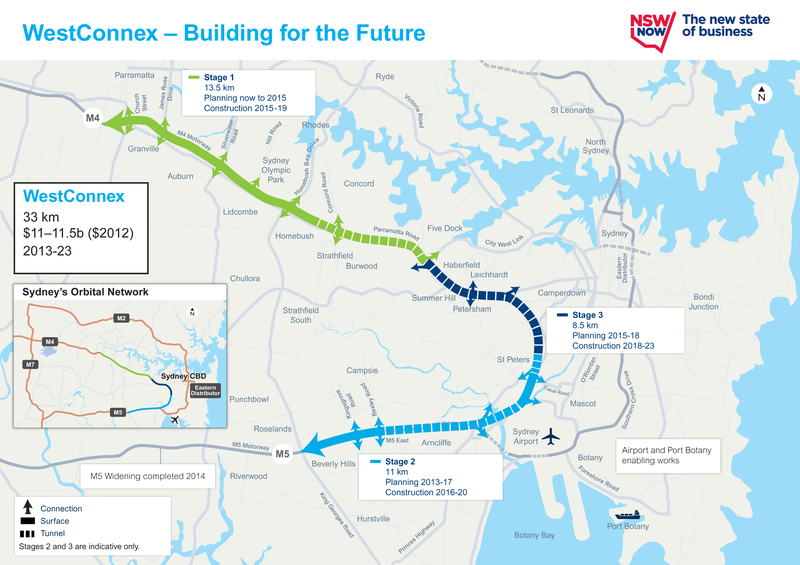 An under the Harbour rail crossing and Northern plus Southern extension to WestConnex would be the major infrastructure projects funded by selling a 49% stake in the NSW electricity distribution network, often referred to as the “poles and wires”. The new rail crossing would form the spine of a future Sydney Rapid Transit network, featuring single deck trains running from Rouse Hill in Sydney’s North West to Bankstown in Sydney’s South West via the Sydney CBD. Funding would also be included for improvements to the T1 Western Line; including improved signalling, track amplifications, and additional stabling. 495 fines were handed out by police in Sydney and Parramatta for jaywalking during as 12 hour period. The blitz was an attempt to reduce risky pedestrian behaviour. 29 pedestrians have been killed so far this year. A $15bn asset sale of the poles and wires business, announced today by the Premier Mike Baird, will fund new transport infrastructure in Sydney with the dual centrepieces being an under the Harbour rail crossing to create a ‘Sydney Rapid Transit’ (SRT) network and North-South extension of the WestConnex freeway. The sale will involve a 99 year lease of the electricity distribution network, but will exclude the regional poles and wires after political pressure from regional MPs. The new SRT network will see single deck trains operating from Rouse Hill to Bankstown via the CBD and will be built in 3 stages. 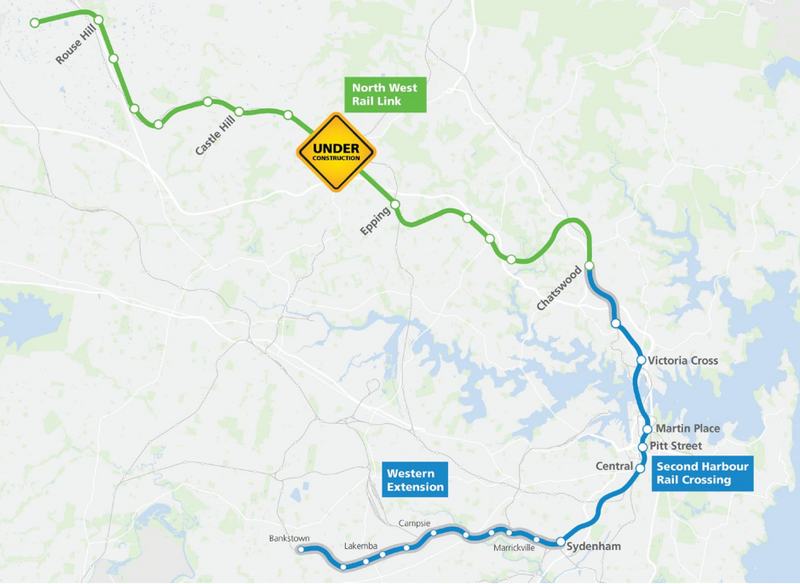 Stage 1 will be the North West Rail Link, which will also convert the existing Epping to Chatswood Rail Link to rapid transit style operations, and open in 2019. 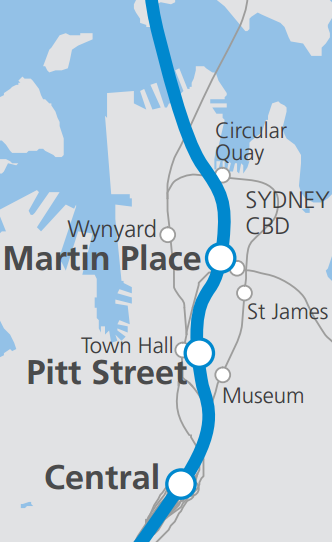 Stage 2 will be an under the Harbour rail crossing and CBD railway with stations at St Leonards, Victoria Cross (North Sydney), Martin Place, Pitt St (Town Hall), and Central Station – but no station at Circular Quay. Stage 3 will involve linking this up to the Bankstown Line, with SRT trains terminating at Bankstown Station – though no stations are indicated between Central and Sydenham and the current alignment does not pass through Redfern. 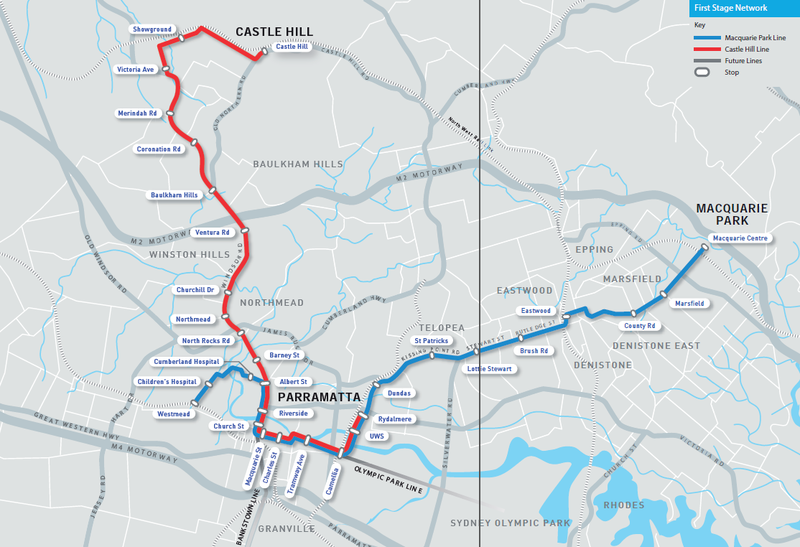 Initial plans, as outlined in Sydney’s Rail Future in 2012, showed an SRT network that also included a line out to Hurstville and continuing on from Bankstown to Lidcombe and Cabramatta. Even the changes to last year’s timetable, which made trains on T4 effectively run all stops to Hurstville and then terminate or run semi-express to Hurstville before continuing appeared to be setting the line up to be converted into rapid transit style operation. The changes to the Bankstown end mean that the line terminates about 20km out of the CBD, neutralising many criticisms that the line was “too long to be a metro”, but also raises questions over what to do with the remaining line out to Lidcombe and Cabramatta. 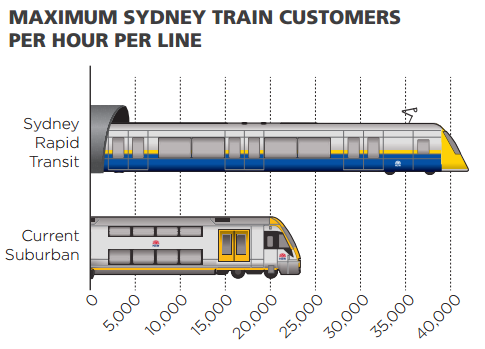 Transport expert Gerry Glazebrook has previously recommended converting these lines to light rail as part of a wider light rail network surrounding Parramatta, which in the context of recent government support for such a network does question whether this is under consideration. The 100,000 additional passengers seems to come down to an additional 40,000 passengers/hour in each direction from the new line and then another 20,000 passengers/hour on the Western Line from infrastructure improvements. However, the 40,000 figure is listed as a target, and will depend on factors like the amount of seating per train, crush capacity for standing passengers, and how well the system copes when highly patronised. Existing double deck trains are often cited as having a maximum hourly capacity of 24,000 passengers/hour in each direction. Few specific details appear available about the Western Line improvements, with Government documents giving general comments about ‘advanced train control systems’, ‘upgrading power supply’, ‘building additional track’, and ‘new stabling’. 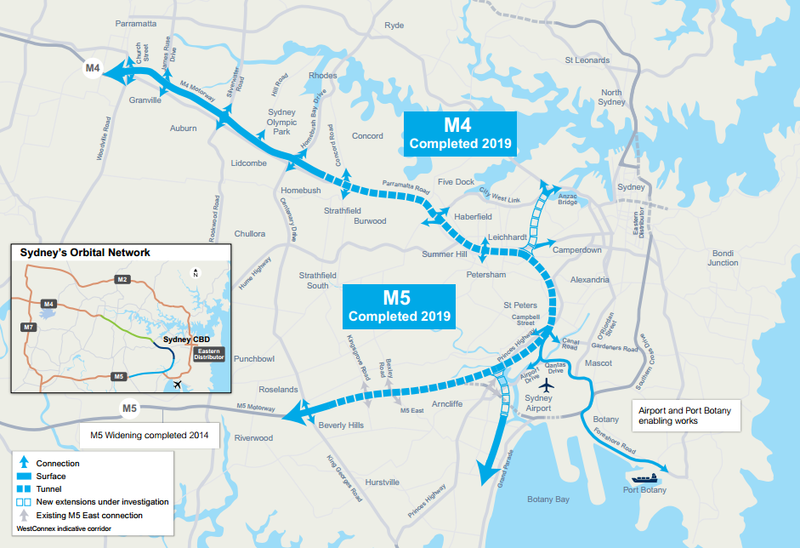 Additions to the WestConnex freeway will also be added, with a Northern extension linking up the M4 to the Anzac Bridge and a Southern extension linking up the M5 to Sutherland. The Government has been dogmatic in its insistence that the North West Rail Link (NWRL) be single deck, and that the new tunnels be built narrower and steeper than the current double deck trains can operate through. What it has not done is to explain its reasoning why, and as a result just about every transport expert, lobby group, academic, journalist, and advocate has become an opponent of its plans. Yet this under the Harbour crossing shows why the NWRL must be single deck – a double deck train would require stations that are too deep. It now appears that even single deck train are unable to climb up from under the Harbour quickly enough to reach the surface for a station at Circular Quay. With double deck trains, how much further would it be before a station was possible at all? The Pitt St Station near Town Hall? Central Station perhaps? The Epping to Chatswood Rail Link was originally devised to include a bridge over the Lane Cover River, but opposition to this required it to tunnel under the river. The result meant removing a station at Kuring-gai (where UTS previously had a campus which later closed in part due to poor transport) and making the remaining stations incredibly deep – North Ryde is 35m underground. Had this been designed for single deck trains, as the rest of the NWRL will be, this may have been avoided. UUPDATE (9:23PM, 10 June 2014): Bold words added to the paragraph below for clarity. The NWRL itself will have a station at Castle Hill that is 25m underground, but with double deck trains the shallow gradient would require it to be 70m underground, twice as deep as North Ryde. 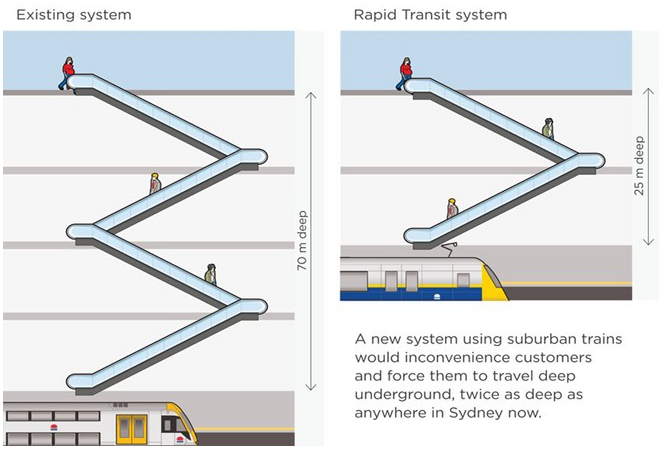 This is so deep that escalators would, to quote Transport for NSW, “probably not even be an option” and all passengers would be required to use elevators to travel between platform and concourse. It is unfortunate that this means current double deck trains will be excluded from the new line. But Sydney has a rail network that is moving towards being operated more as independent “sectors” that do not interact with each other. Rather than being a hinderance, this is a feature that prevents disruptions in one part of the network from spilling over to other parts of the network. Nor is it the case that future double deck trains could not be built to fit into narrower tunnels and travel at steeper gradients. So in the long term, towards the end of the century, options remain open to mix and match how the rail network is organised – just as is being done now with the creation of the Sydney Rapid Transit network. An NRMA commuter survey found that the most common concerns were cleanliness (50%), clear announcements (47%), air conditioning (46%), overcrowding (43%), safety (38%), parking (37%), and insufficient staff (32%). The survey, ‘Seeing Red on Rail’, had 12,000 respondents and is the second annual survey conducted by the motoring group. The Shadow Transport Minister Penny Sharpe blamed the concerns on security on government cuts to security staff; arguing that the number of security staff had fallen from 900 staff in 2011 to 551 staff in 2014, a drop of 39%. When asked what improvements could be made, respondents cited wifi (45%), air conditioning (38%), and mobile apps with real time arrival and departure information (23%). All trains outside of the Olympic Park Line are now air conditioned and real time data has been available on transport apps since April 2013. The last of the 78 Waratah trains has been delivered and has allowed all timetabled train services outside of the Olympic Park Line to be fully air conditioned. During special events air conditioned trains will be provided on the Olympic Park Line, which normally runs as a shuttle service between Lidcombe and Olympic Park. The government has retained 24 un-air conditioned 8-carriage S-set trains. These are used when a regular air conditioned train is unavailable, and are also likely to be re-introduced for regular timetabled services when the South West Rail Link opens next year as it will require an expansion of train services. The Premier Mike Baird announced $10m for a feasability study into light rail from Parramatta to surrounding areas; including Macquarie Park, Castle Hill, and Bankstown. This follows on from a promise from the opposition for a similar $20m feasibility study if it wins the 2015 state election. Work on the study will begin ‘straight away’ according to Mr Baird, and will build on a pre-feasibility study published by Parramatta City Council. The government will spend $1.6m on an 800m bike path along Centennial Parklands, resulting in a new 3.5 metre wide bi-directional cycle path and separate 1.8 metre wide pedestrian path. The new path will help to link Bondi Junction to the CBD along Oxford St in Paddington and is expected to be completed by the end of the year. Planning approval has been granted to the $1.6bn light rail line connecting the CBD to Kingsford and Randwick. Work in the line will commence in 2015 and be completed by 2019 or 2020. State Liberal Party and National Party MPs will on Tuesday consider the potential sale of 49% of the state’s poles and wires assets in a bid to raise capital for major infrastructure projects. The sale will be in the form of a 99 year lease and could raise $15bn, which could then be used to fund a Second Harbour Rail Crossing and other road or rail infrastructure projects. Any “asset recycling”, as this practice has come to be known, will also be eligible for additional Commonwealth funding equal to 15% of any money raised from the sale. The speed limit in the Sydney CBD will drop from 50km per hour to 40km per hour in a bid to increase pedestrian safety. 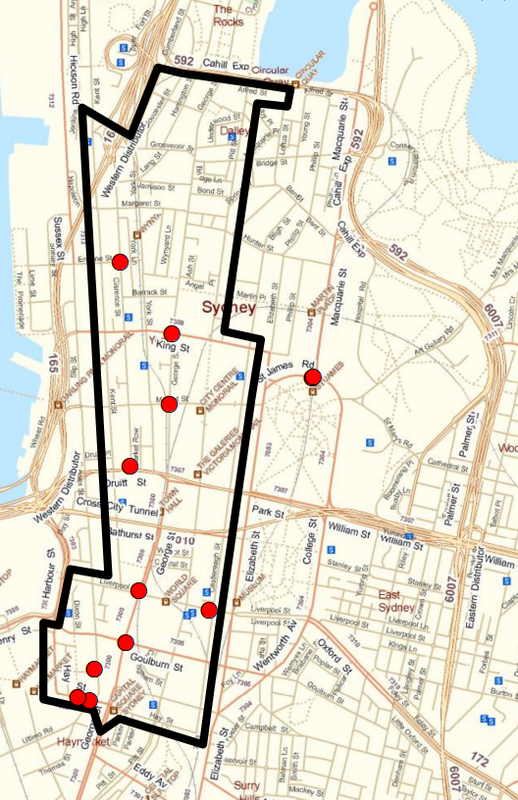 About 93% of trips within the Sydney CBD are made on foot and from 2008 to 2014 there were 7 pedestrians killed in the CBD, including 3 this year. The changes will come into effect by the end of 2014 in an area bounded by Hay St, Kent St, Pitt St, and Castlereagh St.
Two new lifts, a new concourse, and stairs will be installed at Marrickville Station as part of a $32 million upgrade. The upgrade is expected to be complete by the end of 2016. The number of fines for fare evasion has increased to 90,000 in the 12 months following the introduction of 40 Transport Officers in May 2013. There are now 150 Transport Officers checking tickets and handing out fines to fare evaders. The 90,000 fines handed out compares to 73,260 fines handed out in 2012; but is still less than the 128,800 fines handed out during 2011, the last full year in which the old Transit Officers were in service. The role of the 600 Transit Officers (along with the 300 police in the Commuter Crime Unit) have since been taken over by the 150 Transport Officers, responsible for checking tickets and handing out fines; as well as 600 Police Transport Command officers, responsible for safety on public transport. A number of paper tickets are set to be retired on 1 September, with all paper tickets set to be retired at some point in the future. Most tickets set to be retired later this year are periodical train tickets (monthly, quarterly, and yearly) which, due to heavy discounting, are often cheaper than Opal fares.